I sit with my daughter at her orthodontic appointment. There is nothing inherently special about this day. I'm just glad that we're together, even if it's for something as mundane as dental appliances. From this vantage point, sitting and leaning against the window, I see the winter wind blowing cold, taunting and bending bare branches low. Inside, I see kids and wires and wide open mouths...assistants with masks and pliers and brackets....and other waiting moms putting in time texting or flipping through out-dated magazines until whisking their metal-mouthed child off to the next committment. And then I spot the art...a spark of beauty in the ordinary. I pull out my camera and take some shots. I'm suddenly having fun. While other moms read articles on fitness and diet, I take pictures of a coffee cup and smile to myself, delighted at the irony of it all. 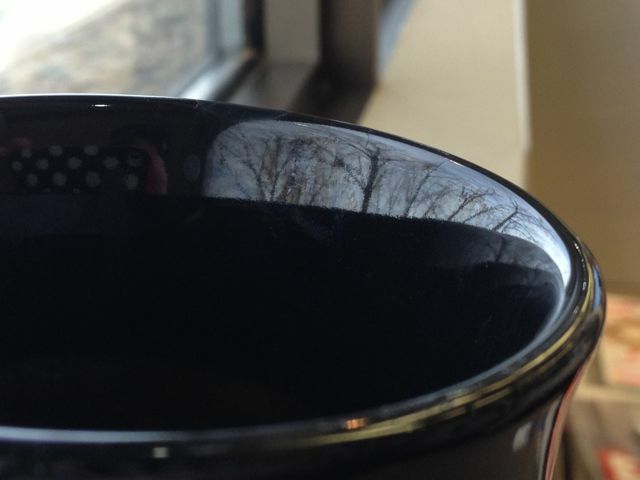 It's a boring old coffee cup with an orthodontic logo on the side, yet it reflects beauty. It gives me a new way of seeing the world outside that isn't nearly as dreary or cold. “I realized it for the first time in my life: there is nothing but mystery in the world, how it hides behind the fabric of our poor, browbeat days, shining brightly, and we don't even know it." And I smile because it also gives me hope -- hope that even in the mundane circumstances of my life, when I'm used up and empty, and certainly in need of cleansing, that I can reflect beauty too. I admit I don't always do this well. There are times, two particular instances from this weekend alone, that I can reflect the downright ugly---- those tender, insecure places in me that can ooze ugly. The hope comes in knowing that this is where God's tender mercy, healing, and forgiveness comes in. He takes those places in me and transforms them with his lovingkindness, from ashes to beauty. Eugene Peterson, in Run with the Horses, insists that "no true spiritual life can be distilled from or abstracted out of this world of chemicals and molecules, paying your bills and taking out the garbage." I'm being transformed and renewed right in the middle of my messy life. If I am to shine, to reflect beauty in any way at all, I want it to be NOW --right here in this unremarkable moment. What a shame it would be to keep waiting for some time way off in the future when I might finally have my stuff together and be rid of insecurity once and for all. If I wait that long, I will never shine at all.